Daily Delicious: Low carb Chicken Cordon Bleu Casserole | What's Ta Eat? The boyfriend is a HUGE fan of chicken cordon bleu — and will sometimes buy those frozen chicken cordon bleu processed food items that looks like a Hot Pocket. 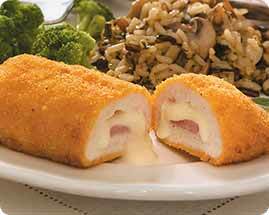 You bake it in the oven for 20-30 minutes or so, and BAM, chicken cordon bleu in a sleeve. I’ve been telling him FOREVER that I need to make him a delicious, homemade version of his favorite meal — but it just seems so intimidating, and seems like a recipe I could easily screw up! I spotted a recipe for Chicken Cordon Bleu via a blogger I have featured here on the blog at least a couple times: Peace, Love and Low Carb. 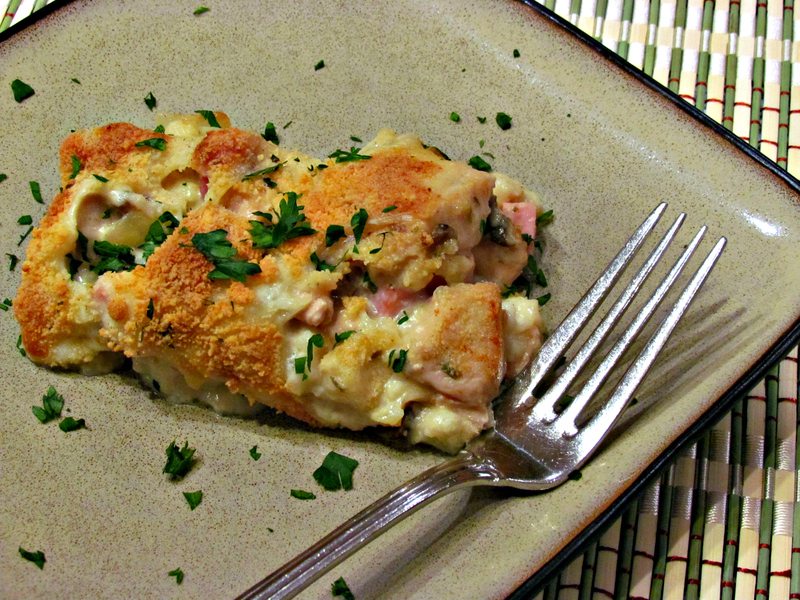 This recipe is for Chicken Cordon Bleu Casserole! I mean, if I’m going to go to the trouble of making this, why not make it Paleo/low-carb? I feel like if I made a big casserole, I’d be eating Chicken Cordon Bleu Casserole for weeks! HOWEVER, for this recipe, I might have to just scale it down to make a smaller casserole for the boyfriend and I to enjoy some weekend this fall or winter — as this hearty, hot, comfort-food-esque recipe would be perfect for a cooler (or snowy!) day! And hopefully, it would become one of the boyfriend’s favorites! Ingredients include chicken breasts, cauliflower, chicken broth (preferably homemade), ham, onion, mushrooms, heavy cream, parmesan cheese, sour cream, swiss cheese, and seasonings. The recipe takes 15 minutes for prep, and 45 minutes of cook time — and depending on the size of your casserole dish, can make between four and eight servings. GET THE RECIPE via PeaceLoveandLowCarb.blogspot.com. This entry was posted in Daily Delicious, Uncategorized. Bookmark the permalink.